This entry was posted on Saturday, December 3rd, 2011 at 11:28 am	and is filed under epistomology, feature, probability, stats. You can follow any comments to this entry through the RSS 2.0 feed. You can leave a comment, or trackback from your own site. In short, the coin doesn’t have memory, but it MAY have bias. Because its assumed to be a fair coin, its assumed to be perfectly unbiased – and such a coin only really exists in pure theory. There is no way to determine the bias or the true probabilty of ANY event without performing the experiment or event a sufficient enough time that you can get the sample size up high enough to get the confidence interval narrowed down. But once you’ve established a good estimate of the true probability of the biased coin (60% heads for example) then it IS true that the coin has no memory. 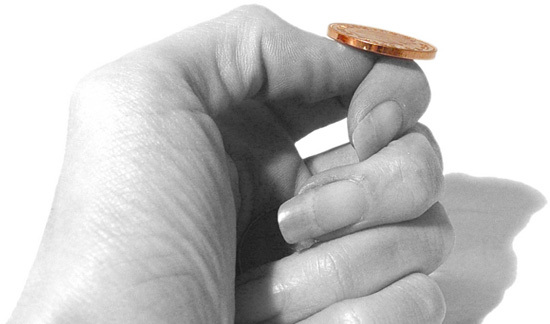 You might flip a coin 10 times and get heads 10 times, and on flip 11 you will STILL have a 60% chance of getting heads. This is no different than the theoretical case where you have an unbiased coin, and flip it 10 times and get heads 10 times. The only difference is that your odds of the next head is 50% instead of 60%. Basically, it should be rephrased that any random number generator has no memory of its past history. BUT every throw gets you closer to knowing what the true probability of an event is. Everything only breaks down when you assume that the theoretical concept of a perfect random number generator actually exists in the real world. Well put. Though I wonder if it ever makes sense to say that a coin has a “true” probability of landing on heads, as in some immutable property of the coin itself. It seems like the information we gain lets us make limited inferences about that coin tossed in a particular way over a particular period of time (obviously a coin will change slowly). Interesting. I’ve started teaching probability the last two years differently since finishing my MS in statistics. I actually teach experimental probability first as opposed to second and discuss how important its implications are. I actually had answers on my last test that described how experimental probability is a more accurate way to describe a solution than describing all possibly outcomes. Leaving aside the possibility that the coin flipper can sufficiently control the flip to bias the outcome (see the mathematician/statistician/magician Persi Diaconis’ work) and making the weaker assumption that individual flips are independent of each other with probability P(H) = p not equal to zero or one, you can use John von Neumann’s algorithm/trick to construct a virtual “honest” coin: 1) Flip the coin twice, 2) if outcome is HT, with P(HT) = p*(1-p), the virtual coin is H, 3) if outcome is TH, with P(TH) = (1-p)*p, the virtual coin is T, 4) if outcome is HH or TT, go to step 1. Similar constructions can be use to build honest virtual dice, etc. I rather liked Against the Gods. Computer-generated random numbers can be worse! With that old standby, the linear congruent generator, you’re assured of never getting the same number two or more times in succession. Excellent article, but I can’t believe the name of Thomas Bayes appears nowhere in it. Hi Michael, what are the ideas you believe Bayes could help in this subject?